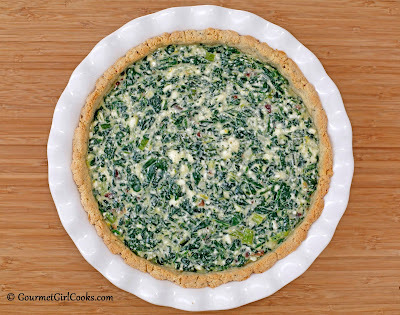 This evening I was in the mood for my Greek Style Spinach-Feta Pie. I had all the ingredients on hand. I decided to add in some crumbled cooked bacon to switch it up a bit. It turned out amazing. I have several different versions of this pie. My favorite is my original version with crust. 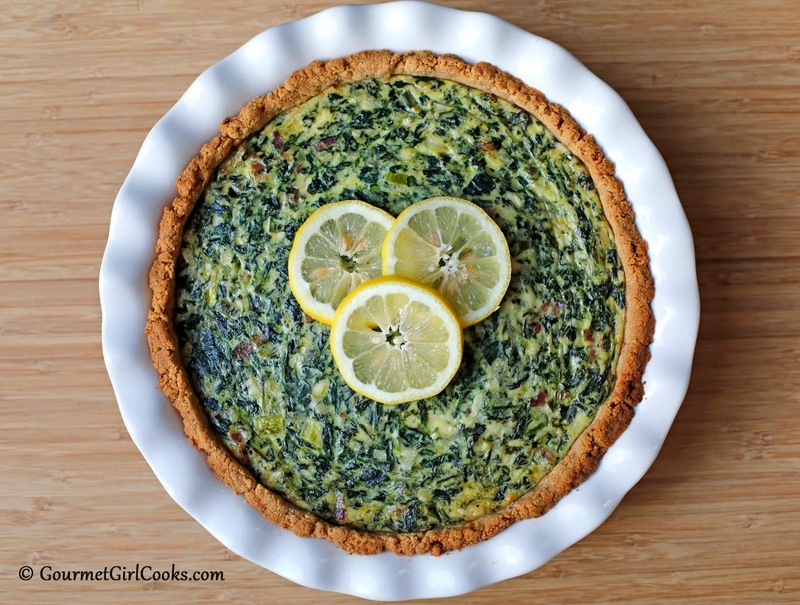 I also have a more quiche-like version that doesn't include any almond flour. My second favorite version is my "Impossible Pie" version that makes its own crust (much like the old Bisquick Impossible Pies). It's a bit quicker to make when you aren't in the mood to make the crust (although if you have a few extra minutes, the crust version is awesome). My favorite thing about making this dish is that it provides me with a quick and delicious lunch for several days afterward. I have eaten this pie for breakfast, lunch and dinner...and for all 3 meals in one day, believe it or not. It reminds me of one of my old favorites, Spanakopita. I included my recipe below (with the optional bacon added). I snapped a few photos below. Enjoy! Filling is poured into the partially baked crust and ready to bake. Preheat oven to 325 degrees F. Place all crust ingredients in a medium bowl. Cut butter and egg into flour with a pastry cutter until mixture resembles small pebbles and the flour is thoroughly moistened (the same way you prepare a pie crust). 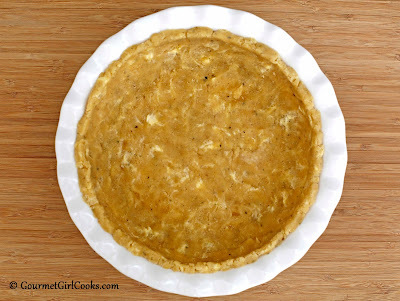 Press crust mixture into a 9.5 or 10" pie dish or tart pan using your hands and fingertips. Bake for approximately 15 minutes or until lightly browned; remove from oven and set aside. Increase oven temp to 350 degrees F. In a non-stick skillet, saute onions and garlic in olive oil until translucent; remove and set aside. In the same skillet, saute spinach, just until wilted. Drain and squeeze out as much liquid as possible (I use a mesh strainer and press it with the back of a large spoon). 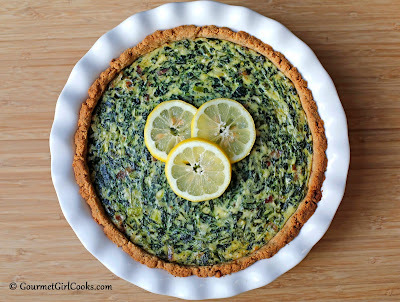 Coarsely chop spinach. 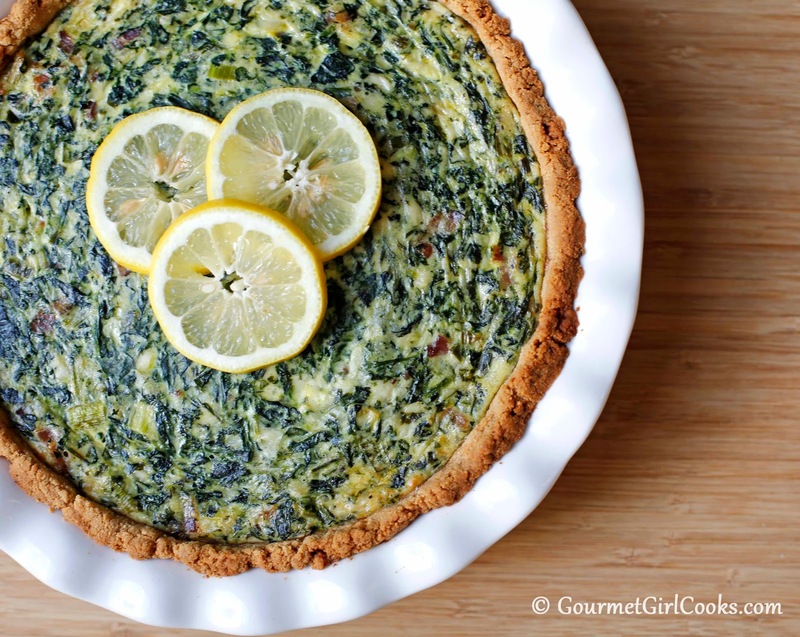 Place drained and chopped spinach in a medium bowl; add cooked onions and garlic, feta, dill, lemon zest, pepper, eggs and half-and-half. Stir in optional bacon; mix until well combined. Pour mixture into lightly baked crust and bake at 350 F for 20 minutes; lower oven temp to 325 F (to prevent edge of crust from over browning); bake for an additional 10-15 minutes, or until filling and eggs are set and cooked. If the center still seems a little jiggly, cook an additional few minutes. If edges of crust begin browning too quickly, loosely cover pie with foil near the latter part of cook time. I just made it again and made a few changes, one being I replaced 20% of the almond flour with ground flax seeds. I'm hoping the flax seed works it's magic (nut flours make me a little irregular!) I didn't notice any difference in the taste ..was still great! I also added a cup of diced ham left over from the holidays and that added a nice flavour. If anyone hasn't already tried it - I suggest rolling the 'dough' out between two squares of cling wrap. Thanks again for all the work on this blog - I'd never have gotten this far (lowered my pre diabetic numbers and lost 20lb's) without this site!! For me, I just omit the crust all together on all the quiches. Never seem to think it is worth the extra carbs or time and energy. 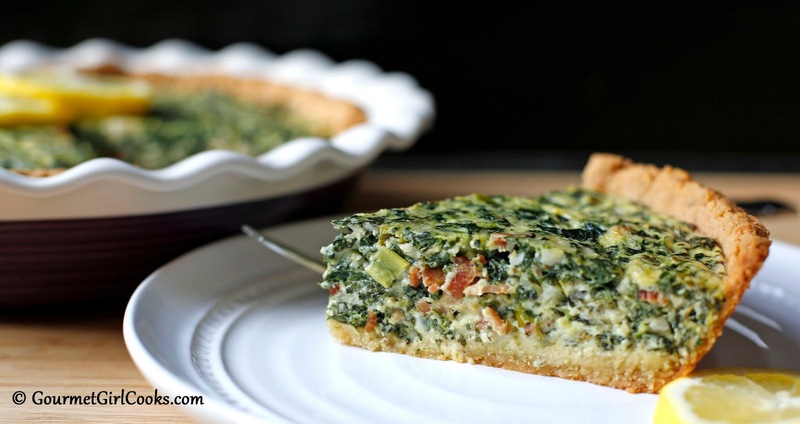 Just makes a crustless quiche and still yummy.